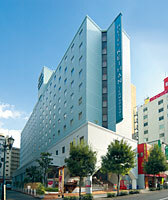 Hotel Keihan Tenmabashi is conveniently located close to government district and adjacent to Osaka Castle. Hotel is equipped with shower toilet and uses negative ion water which has beauty and health benefits. All rooms have free optical LAN connection. The hotel also has self-laundry corner for the convenient stay.